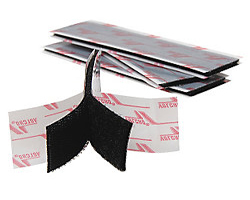 Hook and Loop sets made from genuine VELCRO® Brand adhesive backed tape. You can choose from five different cut lengths, three different adhesive types and two colors to suite your application needs. If you require special packaging, different lengths, widths, or quantities please call 800-635-5252 for an immediate quotation.